New network sites usually start up with the model basic template site. A fresh WordPress site needs setup modifications when creating a new site. A sub-site administrator should not have to adjust this setup very often. However, occasionally a member may need to make setup changes to the template site setup. The guide information below introduces basic site setup steps and operations for sub-sites in the lakekit.net network. Helpful additional details and diagrams for WordPress are available at the Easy WP Guide. Add “/wp-admin” to the internet site address. An example admin address is lakexxx.lakekit.net/wp-admin. Then enter the username and password. Logging in brings up the dashboard page. The left sidebar provides a menu to perform various tasks. The main content area has information about the site and WordPress. Note that this dashboard main content provides the available storage space and used space for the site as well as statistics for the site use. What is displayed in the main content area is set using the “Screen Options” toggle at the top right. 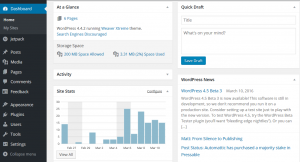 A fresh WordPress site usually needs some reconfiguration at Dashboard -> Settings. Some of the most likely settings to change are summarized below. The General settings include the site title and tagline. These are often displayed in the header area, depending on the theme. The desired timezone is also selected here. Be sure to save any changes made. A fresh site that does not use a model basic template site is configured as a blog. In order to change to a traditional site, set the Front Page to a “Static Page” and set the “Post page” to be the Front or Home page. [A fresh site does not have a “Home” page created. That will be covered below.] If not using a model basic template site, go to Dashboard -> Appearance -> Customize -> Homepage Settings and set your Homepage Displays to A static page and choose your home page (landing page). Set the Posts page to the location where you want posts to appear. Until a website is ready for public use, the site should be private or at least set to discourage search engine indexing. To discourage search engine indexing, check “Discourage search engines from indexing this site”. This setting is found at Dashboard -> Settings -> Reading. When you are ready to share your site with the public, you should then encourage search engines to index your site. Once indexed, if someone wants to find your site without knowing the site address, they can then search in one of the search engines such as Google and find the site. If you do not want to allow comments, uncheck the “Allow people to post comments on new articles” box. This setting is located at Dashboard -> Settings -> Discussion. Unchecking removes the comments area for a site page. Save changes. The Genesis Theme will be used for all sites beginning in 2018, and sites built prior to 2018 will be gradually transitioned to this theme. Most options for setting the appearance of the site pages are found at Dashboard -> Appearance. The options available under Appearance will vary depending on the active theme. The menu, widgets, header, and customize options are available for all themes. The Customize option is described next while the other appearance items are described below. Each theme permits appearance modifications using the Customize option. The Elementor drag and drop plugin is used to make most appearance modifications. Elementor is briefly described in the Page Content section in this general guide. 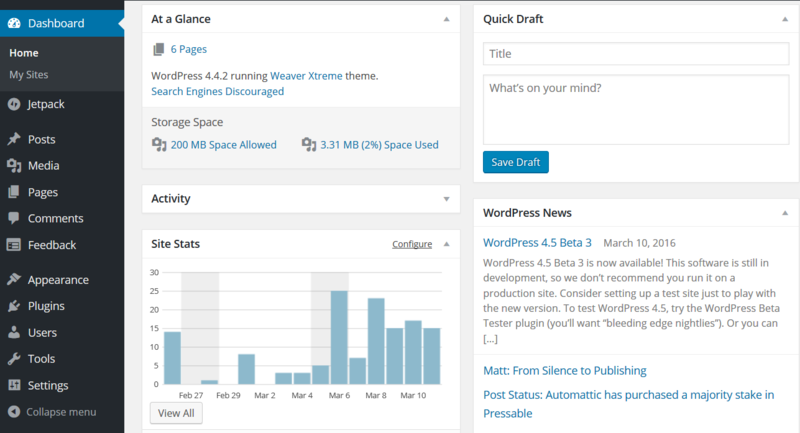 Dashboard -> Pages (or posts) -> Add New gives the editing area for a new page. Creating blank pages for the pages expected to be needed is a good way to start because that allows creating a menu as explained below. Enter a title for the page and “Publish” the page. Follow the same step to create blank pages for the other pages planned for the site. Dashboard -> Pages -> All Pages lists all the pages for the site. Pages (or Posts) are further explained in a separate section in this General Guide -> Page Content. The site menu bar provides visitors access to the webpages of a site. Instructions are provided for modifying the page header image at basicsite-2.lakekit.net. Click on Startup Instructions in the green section at the bottom of the Home page, then click on Header Modifications. The typical sidebar in a website is on the right side of the main content. Sidebars contain widgets which are text, graphics, or other features that enhance the page presentation. When the Elementor drag and drop plugin is used, the sidebar is usually removed, making the main content area the entire space. Widgets can then be placed anywhere in the main content area, including in a column on the right side of a page. With the Genesis Theme, no edits are needed for the footer area. The current copyright and site title are automatically displayed. See basicsite-2.lakekit.net Startup Instructions for additional information on Footer options. Plugins likely to be used in most network sites are network activated. These plugins are always available to use. Some plugins are not network activated. They can be found at Dashboard -> Plugins. These plugins are only used if the sub-site administrator decides to activate them. This network site is set up so that initially each sub-site has an internet address or URL of the form lakexyz.lakekit.net. The “lakexyz” may be any name the lake organization chooses. Most site owners will probably want to have their own domain name such as “lakexyz.org”. The network administrator can “map” the owner’s domain name to the sub-site name. This means the original address of lakexyz.lakekit.net becomes lakexyz.org for internet users. Accomplishing the domain mapping requires that the lake organization register its domain name with one of the many domain name registration services. Contact the network administrator for further information to map a sub-site domain name.